For many years, levee systems were built along rivers to hold back flood waters. They work very well…until they don’t. When a levee ruptures, the resulting flood is usually devastating. From June through August of 1993, the midwestern United States received an unusually large amount of rain…far more than normal. The rain led to severe flooding, particularly along the Illinois and Missouri shores. 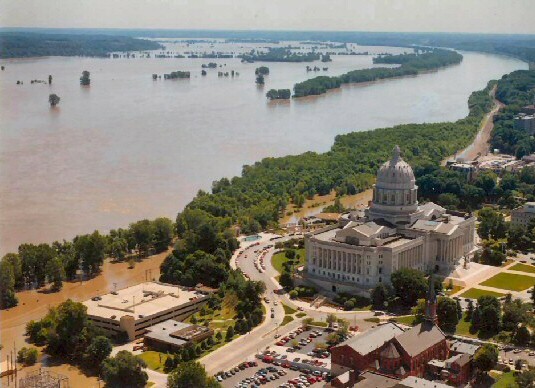 Then, on July 22, 1993, the levee holding back the flooding Mississippi River at Kaskaskia, Illinois, ruptured. The town’s people were forced to flee on barges. 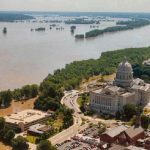 In all, more than 1,000 levees burst in late July, but, the incident at Kaskaskia was the most dramatic event of the flood. The town, which was virtually an island, was protected by a levee that the town attempted to shore up even after the bridge connecting the town to the riverside was wiped out by the rising river. At 9:48am, the levee broke, leaving the people of Kaskaskia with no escape route other than two Army Corp of Engineers barges. By 2pm, the entire town was underwater. The rupture of the levee at Quincy, Illinois, left no way to cross the Mississippi River for 250 miles north of Saint Louis. In Grafton, Illinois, flood waters reached two stories high. Other towns fared somewhat better, but the flooding was bad everywhere. In Saint Genevieve, Missouri, the entire town turned out in a desperate attempt to raise the levee. Prisoners were even brought in to assist the effort. The river crested at a record 49 feet, just two feet below the improved levee. 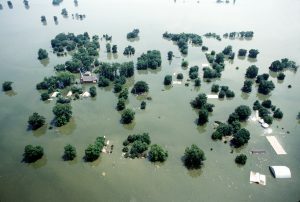 The flood inundated 1 million acres of prime farm land and wreaked havoc on the area’s economy. Miles of wheat fields were too saturated to harvest that season. In addition, the herbicides from the farms washed down the river and severely damaged fish farms in Louisiana. Many other people lost their jobs when barge traffic on the river was suspended for two months. 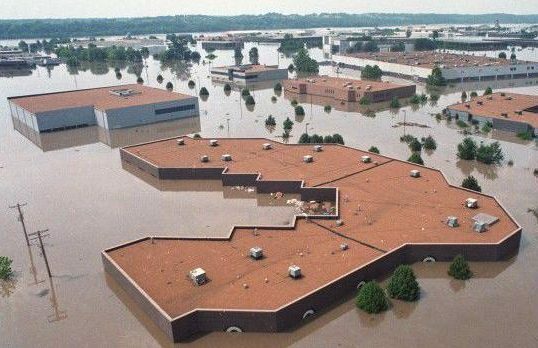 The Mississippi flood of 1993 caused $18 billion in damages and killed 52 people. Levees can save lives, but when levees fail…people die, and property is destroyed. Sometimes, there is some warning, but other times, the flood that was expected, brings with it an unexpected consequence. And I can’t think of a worse unexpected consequence, than having far more water inundate an area that the flood could possibly have brought in. That was the case in 1993, and especially the case in Kaskaskia, Illinois. No one was prepared for the massive amount of water, and for 52 people, there was no way of escape.